Lakeside Square is one of the premier office buildings in Park Central and benefits from its impressive stature, modern architectural design and tranquil lakeside setting. Its reflective silver glass exterior and white marble lobby create a distinctive modern environment with classical touches unique in the Class "A" leasing market. Park Central is a master-planned, mixed use development in the southern corner of US-75 and I-635, one of Dallas' most heavily traveled intersections. Standing 18 stories with 403,120 rentable square feet, Lakeside Square is highly visible from every direction, within proximity to Dallas' most prominent neighborhoods and steps away from Medical City. 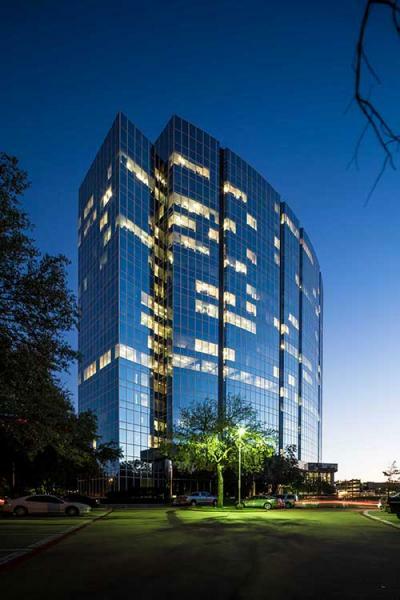 This property is perfect as a Dallas corporate center or focal-point of a professional services business. The building sits near numerous retail centers and is situated midway between the Dallas Galleria and NorthPark Center. Lakeside Square tenants have myriad choices when it comes to dining, shopping and hotels. In 2013, Lakeside Fitness Center opened as a state-of-the-art health and fitness amenity. With more than 2,400 square feet of professionally designed space and abundant natural light, Lakeside Fitness offers serious athletes and weekend warriors a complete fitness experience. The gym is fully equipped with state-of-the-art strength and cardio equipment including five recumbent bikes, three elliptical trainers and four treadmills -- featuring personal media centers with cable and wireless access. Lakeside Fitness is equipped with a Universal Weight Center and free weights from 5-50 pounds. There are spacious locker rooms for men and women equipped with two showers each and 24 lockers for daily storage. In addition, Lakeside boasts a Murphy's Deli, car wash, conference center with wireless access and an adjacent six-level garage with a parking ratio of 3.2:1000.